As I was expecting, after posting article on D-60 chart & Moola Dasha, Pandora Box will be opened and it has opened. I received requests to write Article on all Divisional Charts. I wil cover all important D-charts one after the other in between other articles, so that we are not limited to learn only one aspect of Astrology, i.e. D-Charts, but we should cover all other important stuff simultaneously. So, today is the 2nd article on divisional charts and it is Navamsha Chart or popularly known as D-9 chart. D-9 is considered as one of the most important D-chart and I understand it is because it is divisional chart which belong to 9th house of our main chart. As we have 3 Dharma Houses/Houses related with Righteous Path in Life, i.e. Houses # 1, 5 & 9. 1st house is Dharma to Self. It shows the righteous life path for Individual which satisfies self. House # 5 is Dharma to Others/World. It shows the righteous actions we must follow towards others, which satisfies others in our life. House # 9 is Dharma towards Universe. It shows the righteous path we should follow to work for Higher Universal Goals. So, 9th house is where we come to know our righteous path for the Universal Benefits. That’s why, 9th house is the highest of Dharma House, as we get rid of our selfish aims and tendency to please others in our life and work towards the true purpose of our being. D-9 is an expansion of this 9th house only. One thing that is publicised is that D-9 chart rules over your life after mid-30s or person becomes like an individual of D-9 chart after mid-30s to fulfil his Dharma of this life. Well, if it is true then what about someone passing away in early 20s or early 30s? Any views about Swami Ramatirtha, who passed away at 33, or Swami Vivekananda, who passed away at 39 but already gave his historical speech at Chicago when he was 30. Didn’t they fulfil their Dharma as per D-9? This is where I have my reservations on different opinions regarding different things in Astrology. It is incorrect to say that this chart supersedes that chart or this system is better than that system or this dasha is more accurate than that dasha system. Why can’t we just accept all? Why we need to create competition everywhere? Every concept of Astrology has its importance. Let’s value all of them equally. Let’s follow a system where everything can have parallel-existence. 99% of us are not aware of our life purpose. In such cases, marriage and married life becomes the purpose for almost all of us. It just fills that void in our life and we suddenly find our purpose in life by Family and Children. We start thinking that we will do everything for them. That’s where D-9 becomes prominent for marriage. 9th house is house of Righteousness and Morales. Your spouse is supposed to bring and enhance good morale in your life. A marriage which is not based on morality may not last long. Hence, D-9 becomes important in seeing the kind of married life one may have. I think indicator of spouse should be positions of 7th house lord, Venus (for a guy) or Jupiter (for a girl) and Darakaraka (planet with the lowest degree except nodes) in D-1 and D-9 should be seen to know the righteous path or married life. How D-9 should be read? How D-9 is made? – I understand that all the D-charts are easily available through softwares and website but it is always better to know the basics and how these charts are made. A little more info doesn’t harm. Ashwini - p-1 – Aries, p-2 – Taurus, p-3 – Gemini, p-4 – Cancer. Bharani - p-1 – Leo, p-2 – Virgo, p-3 – Libra, p-4 – Scorpio. Revati - p-1 – Sagittarius, p-2 – Capricorn, p-3 – Aquarius, p-4 – Pisces. Ascendant of D-9 – Now, if someone has Ascendant in birth chart at Scorpio, Ascendant Nakshatra Jyeshta and Nakshatra Pada – 3. Then, simply look at the sign name in front of Jyeshtha P-3. It is Aquarius. So, ascendant in D-9 will be Aquarius Ascendant. Likewise, we can know the ascendant for any nakshatra pada. Planetary Position in D-9 – Likewise, we need to check the nakshatra and pada positions of planets in D-1 and then planet should go into resultant sign in D-9. Like, if someone has Sun in Sravana Nakshatra, Pada 4, it should go into the house where Cancer falls in D-9. If Mercury is in Sravana Nakshatra Pada 3, it should go into the house where Gemini falls in D-9. Out of all D-charts, the calculation of D-9 and its making is simplest. Now, How to read D-9 Chart? Every D-chart can be and should be read as an independent chart. It is just that whole analysis changes its shape as per the purpose of chart. Like, D-9 is for Marriage. So, 2nd house of D-9 shows the Wealth you are “making” after marriage, 3rd house will show the kind of communications you may have with spouse, 4th house is Peace in Relation, 5th house is the love factor in marriage etc. Now, if you are seeing D-9 for Righteous Path in Life, then 2nd house of D-9 shows the Wealth you are “making” on that path, 3rd house will show the kind of efforts you may need to make for following that path, 4th house is Peace of Mind after following that Path, 5th house is the Happiness Factor on that Path etc. But as every D-chart is for a specific purpose, we can include some specific criteria to judge a D-chart relevant with its purpose. Ascendant and position of Ascendant Lord – As always, 1st check the Ascendant and position of Ascendant Lord. Like in example chart here, Ascendant is Gemini, a sign of Communications, and its lord Mercury is with Moon in 11th house. Mercury is again Communication. Moon is taking care of people. 11th house is Higher Purpose/Goals or Social Welfare. So, this person’s righteous path in life would be to take care of people through his communications for the common good and social welfare of all. If looked for marriage matters, then it would show that person needs to be very communicative with spouse and emotionally connect with him/her. Then only higher purposes of marriage will be accomplished. 9th house and 9th house lord – As it is 9th divisional chart, we need to check 9th house and position of 9th house lord in D-9 chart. Jupiter-Venus, 2 teachers, are there in 9th house in sign of Aquarius and Aquarius lords Rahu and Saturn are in 2nd house. 9th house is Higher Wisdom, Aquarius is Humanitarian Purposes, Jupiter-Venus both are Teachers. So, it looks like a righteous path of a World Teacher. Also, both lords of 9th house are in 2nd house in Cancer shows that through his world teaching, this person will take care and nourish people and that will become wealth of following his life path (2nd house of D-9). 7th house and 7th house lord – If D-9 is being looked at for Marriage purpose, then 7th house and 7th lord should be seen. But 7th house actually show Other People and Masses. 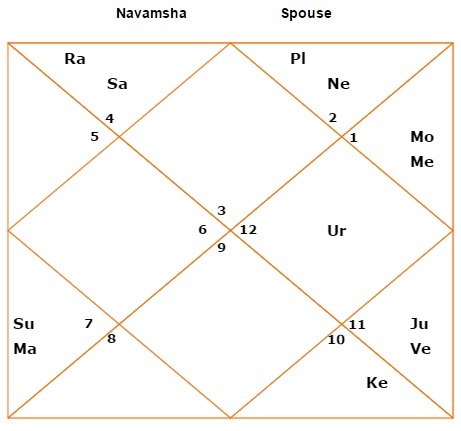 Here, in this chart as 7th house has Sagittarius sign there and its lord Jupiter is in 9th house of Higher Learning, Philosophy and People of different ethnicity, it shows that this person will meet people of different ethnicity on his life path and will share his knowledge to them as a Guru. If looked at marriage matter, it would show spouse from different ethnicity and person may shift to far distant place after marriage. Venus – Every D-chart has a karaka and D-9’s karaka is Venus. So, while reading D-9, we must look at Venus position. As this chart has Venus with Jupiter in 9th house, we have already discussed that it shows a life path of a World Teacher. Atma Karaka & Amatya Karaka – Atma Karaka is the planet with highest degree and Amatya Karaka is the planet with 2nd highest degree in chart, except Rahu & Ketu. Atma Karaka shows the destination of soul and Amatya Karaka shows the path by which you will reach the destination of soul. If Atma Karaka & Amatya Karaka are conjunct in a house, then it is a powerful Raj Yoga as per Jaimini Astrology. As per this birth chart of this person, Venus was Atma Karaka and Jupiter was Amatya Karaka. As I said, both are conjunct in D-9 in 9th house, hence a powerful Raj Yoga. 9th house is again Higher Learning. So, sets his destination as a World Teacher and path to reach there was Higher Education, Religion and Philosophy. Let’s open the secret. This is D-9 of Paramhansa Yogananda. Darakaraka – Again, if you are looking at D-9 for marriage, you need to take Darakaraka into consideration, which is planet with the lowest degree in birth chart, except Rahu & Ketu. Darakaraka’s position and dignity would also indicate about spouse. In case, person with similar D-9 chart gets married then it again shows that Communications are going to be foundation of relation and spouse can be very communicative, may be a preacher/teacher/counsellor at a big institute or organization. Mahadasha & Antardasha (MD/AD) – Now, MD/AD won’t only impact D-1 chart but also D-charts. As we can see here, Venus was Atma Karaka, the destination of soul and he went through Venus MD between 5-25 years of age. In that tender age, he already decided to follow the spiritual path in life. It was due to Venus being in 9th house of D-9 in that powerful Raj Yoga with Jupiter. So, the concept is that when these signs aspect each other, planets sitting in each sign also aspect each other in different signs, hence mutually impact each other. It increases the possibilities of predictions and events. @ SS - please apply for marriage consultation thru consultation tab. Sir,D1 is also Taurus ascendant, Jupiter and Venus conjunction in 7th house, mars in 4th & Saturn in 10th,Will I have love marriage? @ Subhashree - i prefer D-1 reading 1st of all. Sir, what if Venus in Taurus Navamsa is debilitated in 5th house with Ketu in Virgo? @ iqra - life path involving dealing with people of different culture. I have rahu and pluto in my 9th house in navamsa chart and rahu in 7th house in lagna chart. Wht does it show? @ Rishi - live-in relation can be considered just like a marriage. I will write an article abt 2nd marriage soon. Sir if a person have a live in togather relationship, is that consider first marriage already? 2nd marriage is seem from 2nd house or 9th house of D1 sir? Very confuse about which house to see for 2nd marriage. See my Venus is debilitated in navamsa with Ketu in 5th house so rahu is aspecting Venus from pisces so is there any problem with debiliation? Sir scorpio ascendant d1, Venus which is 7th lord in 6th house aspected by Saturn and Jupiter and Jupiter in 12the and also rahu and ketu 1:7 axis but in d9 Pisces navamsa , Venus in 3rd (own house) with mars and mercury in 2nd, rahu in 5th and Jupiter in 1st ,sun moon in 10th and Saturn in 12.Venus is combust or create problem in married life and there will be love or arrange marriage. @ Janaki - Astrology has nothing to do with marriage - http://astrosaxena.com/ramm. d-9 is chart of right life path. jup in asc in d-9 shows that sharing knowledge and wisdom is important part of your life path. Namaste sir. In navamsha..my jupiter is on the lagna itself under gemini sign. So does it mean my husband will be from my own relative who can be very communicative/talkative? @ deepika - thanks and what is the query? @ Vinita - in such case, relation will prosper between couple if they communicate each other regularly or they travel together. 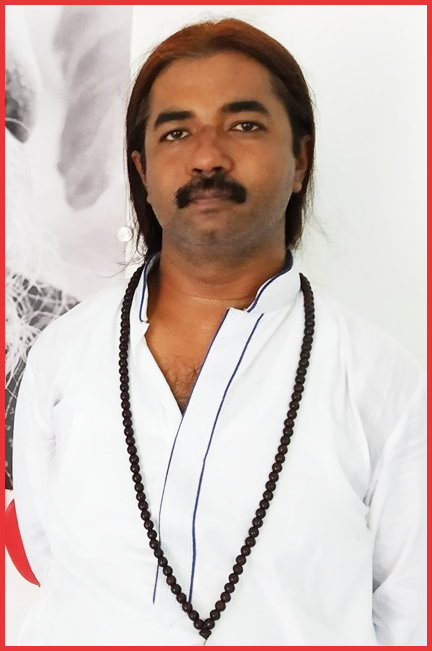 you can read my views on astrology and marriage here - http://astrosaxena.com/ramm. Thanks.